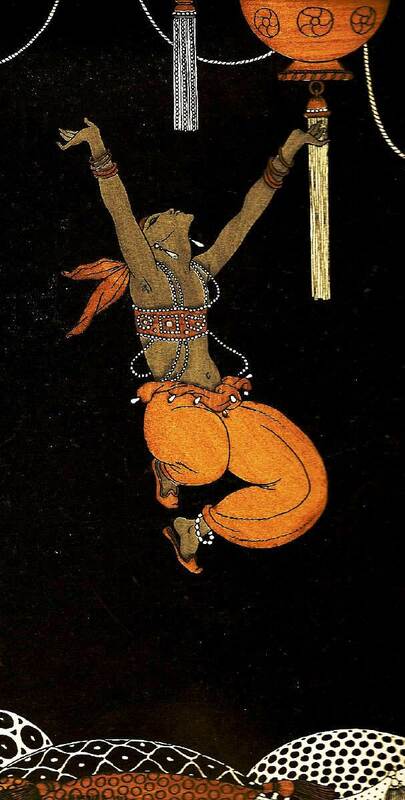 The above picture, a pochoir by George Barbier, shows Mikhail Fokin‘s (23 April 1880 – 22 August 1942) choreography of Schéhérazade, danced to music by Mily Balakirev and Rimsky-Korsakoff, and starring Nijinsky. On 12 July 2012, I published a post on Sergei Diaghilev‘s Ballets Russes, an immensely successful corps de ballet or ballet company, founded in 1909, whose artistic director was Léon Bakst. Among its stars, Vaslav Nijinsky was probably the finest. Nijinsky had acquired skills few male ballet dancers had attained, such as dancing en pointe, on his toes. However, Nijinsky’s career was very short. It was interrupted by a mental illness, schizophrenia, that manifested itself when he was at the height of his career, in 1916, approximately. He died in London, in 1950. Vaslav Nijinsky was born Wacław Niżyński, in 1889 or 1890 in Kiev, the Ukraine. His parents were Polish and he was baptised in Warsaw. In fact, he considered himself a Pole. Yet, he was born and grew up in Imperial Russia (before the 1917 revolution) and therefore spoke Russian more fluently than Polish. But the soul has its laws. He was a Pole. Nijinsky was trained at the Imperial Ballet School, where his teachers were Enrico Cecchetti, Nikolai Legat and Pavel Gerdt. At the age of fourteen, he was selected by famed French choreographer’s Marius Petipa to dance the principal role in La Romance d’un Bouton de rose et d’un Papillon (music by Ricardo Drigo, June 30, 1846 – October 1, 1930. The Russo–Japanese War made it impossible for the ballet to be performed. However, during this period, Nijinsky played several solo roles and, in 1910, prima ballerina assoluta Mathilde Kschessinka selected him to dance in a revival of French choreographer Marius Petipa‘s Le Talisman, which brought Nijinsky to the fore. He created a sensation in the role of the Wind God Vayou. It is at this stage that Nikinsky met Sergei Diaghilev, an impressario who brought Russian art and ballet to the attention of little less than the whole world. Diaghilev and Nijinsky had an affair, yet Nijinsky married Hungarian countess Romola de Pulszky when the Ballets Russes were touring in Latin America. On his return from Latin America, Diaghilev flew into a rage and fired Nijinsky. Nijinsky may well have been the most celebrated ballet dancer of his time, but after being dismissed by Diaghilev and working as choreographer and ballet dancer, he scandalized the normally broad-minded le tout Paris. He did so by showing his character miming masturbation with the scarf of a nymph. Explicit sexuality was a little much even for a Paris audience. Nijinsky had danced to Claude Debussy‘s Prélude à l’après-midi d’un faune. Nijinsky also enjoyed wearing revealing costumes, which was and remains acceptable. Nijinsky and other choreographers danced to music and, in the case of Debussy, contemporary music. Nijinsky also danced to the music of Igor Stravinsky (17 June 1882 – 6 April 1971). In fact, impresario Sergei Diaghilev commissioned three works of music for his Ballets Russes: The Firebird (1910), Petrushka (1911) and The Rite of Spring (1913). Stravinsky’s Rite of Spring changed music forever and so did, in ballet, Nijinsky’s use of angular movements. He was a modernist, a visionary. But, to return to music, it should be noted that much of Russian music is music for ballets (or opera). Pyotr Illich Tchaikovsky (7 May 1840 – 6 November 1893) wrote music for several ballets (The Nutcracker, Swan Lake), and so did Sergei Prokofiev, whose Romeo and Juliet is an almost unsurpassed composition for ballet. Diaghilev also commissioned the Prodigal Son from Prokofiev, but died before he could make it into a ballet. It was choreographed by George Balanchine. Serge Lifar created the role and the ballet premièred on Tuesday, 21 May 1929, at the Théâtre Sarah Bernhardt, in Paris. As for Nijinsky, he was treated, unsuccessfully, by psychiatrist Eugen Bleuler. He spent the rest of his life in and out of hospitals and asylums and, as mentioned above, died in London, in 1950. His body was later moved to a Paris cemetery, in Montmartre. He had one daughter, Kyra, who married Ukrainian conductor Igor Markevitch. They had a son but the marriage did not last. Nijinsky’s continued fame, despite an abruptly and tragically shortened career, constitutes an eloquent tribute as to his exceptional talent. 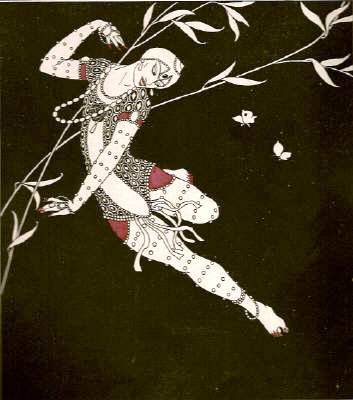 George Barbier (1882 – 1932), an immensely talented and prolific illustrator, produced extraordinary pictures of Nijinsky. These prompted me to write this post. Barbier also illustrated books and worked as a fashion illustrator, which can be discussed in a later post. The Tamara shown in the video is Tamara Karsavina (10 March 1885 – 26 May 1978). 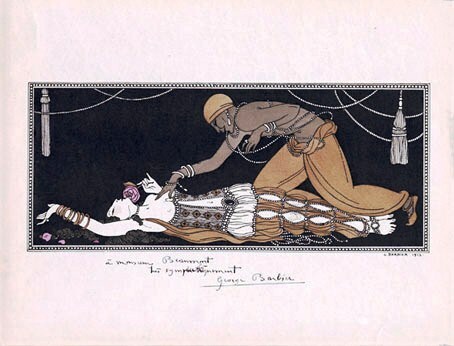 Art featured in this post is by George Barbier (Photo credit: Google images).